“Soon after moving into their seemingly idyllic new home, a family learns of a brutal crime committed against former residents of the dwelling” (United International Pictures). Verdict: Wow, Daniel Craig, I’m impressed, two garbage in a year already. Are you trying to beat Nicholas Cage‘s record or something? 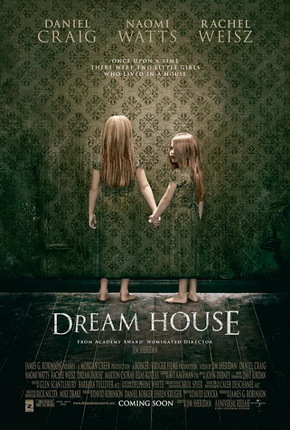 Dream House takes an overused twist and merges it with a pathetic one of its own. Almost the whole first half of the film is a slow and poor build-up to what the trailer has already revealed. The plot is predictable and the dialogues are also very lazily written. Craig provides a very haunting charm, but fails miserably in the acting department for this one. Second opinion: “What?! I didn’t get it. Not scary, no suspense” (Jayren, Hann Yaw). The premiere screening of the film was courtesy of ChurpChurp. no surprise, I was ready to cover my eye and . . . nothing really happen LOL! i like horror movie.. but this is not scary r.. I never hold any high hopes for daniel craig…especially after the cowboys vs aliens movie…LOL i do agree with u that he's as though trying to compete with Nicholas Cage but at least icholas Cage can be a better actor at times..for example Face Off…but he's got a real bad choice in choosing movies…Daniel Craig is next..